Police are searching for a driver who failed to stop after a collision on the A595 in west Cumbria. 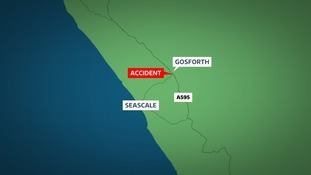 It happened at the junction between Gosforth and Seascale at around 11:20am today. A motorcycle and a silver vehicle - similar to a Peugeot 206 - were involved in a collision, however the driver of the vehicle failed to stop at the scene. The 55-year-old male motorcyclist was injured in the collision, and is now in hospital in a stable condition. Police say the silver vehicle is likely to have rear-end damage, and are appealing for the driver to come forwards. It was believed to have been heading in the direction of Gosforth, or south on the A595, and police are urging anyone who sees it to contact them on 101. The road was closed, but has now reopened.